Kerry Turner has become one of the most recognized names, not only in the horn world, but in brass playing in general. Whether as a composer or a performing artist on the horn, he appears regularly on the great concert stages of the world. Mr. Turner’s major ensembles with whom he performs include the world-famous American Horn Quartet, the stunning Virtuoso Horn Duo, as well as the Luxembourg Philharmonic Orchestra. As a member of these prestigious organizations, he has concertized on four continents. He is also a frequently invited soloist and clinician, having performed and taught all over the world. A native of San Antonio, Texas, Kerry Turner received his Artist’s Diploma from the Manhattan School of Music in New York and, as a Fulbright Scholar, continued his studies with Hermann Baumann at the Stuttgart College of Music. Following his studies, he placed 5th at the Geneva International Horn Competition and won the Bronze Medal at the 39th Prague Spring International Competition. Mr. Turner’s compositional career has skyrocketed over the past several years. His works for horn in combination with virtually every genre of chamber music continue to be heard literally around the world. 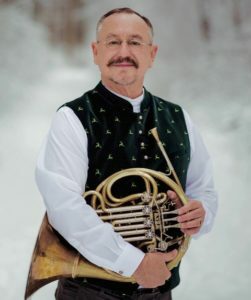 He has been commissioned by many organizations, including the Leonard Slatkin and the Detroit Symphony, United States Air Force Heritage of America Band, the Luxembourg Philharmonic, the Japanese Horn Ensemble, and the horn sections of the Houston and Dallas Symphonies, just to name a few.